The 10mm AUTO caliber was first adopted by the FBI in 1989, following the aftermath of the Miami shootout in January of 1986. It was later decommissioned after agents reported that the recoil was too excessive in terms of practice and training and pistols chambered for this cartridge were a bit unwieldy for people with smaller hands or of smaller statures. However, this has not slowed this round down and it has sustained its popularity with law enforcement agencies and in some groups of supporters and enthusiasts. After rigorous testing in 1988 the 10mm Auto cartridge was determined to be the best caliber for law enforcement use. 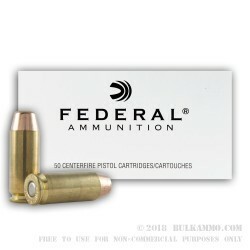 The Federal Ammunition 10mm AUTO full metal jacket rounds feature a bullet with the weight of 180 grains, a muzzle velocity of 1030 feet per second and a muzzle energy of 425-foot pounds. The brass case is heavy duty, reloadable and has a non-corrosive, boxer primer. 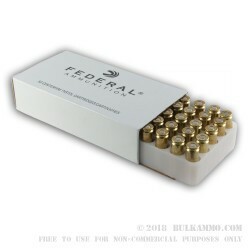 Designed as a training and target practice cartridge, and also being economically priced for a caliber that is normally expensive to shoot, the Federal 10mm loads are range-ready with 50 rounds per box. Want to load up on these rounds? 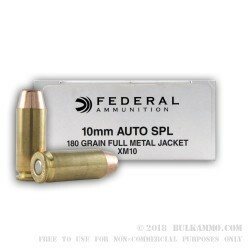 We sell the same exact ammo in a bulk 1,000 round case here. Typically, you can save per round when you buy in bulk!